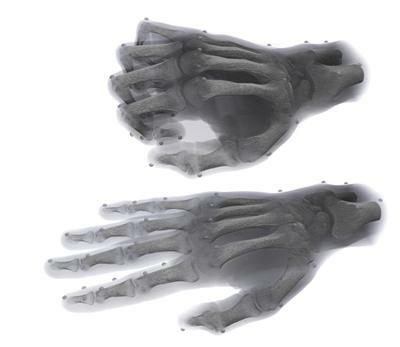 Clinicians and researchers in Southampton are leading a pioneering study into the use of computer-generated hand models to help improve the success of joint surgery for patients with arthritis. Currently, surgery to replace the proximal interphalangeal (PIP) joint – the second joint in the finger from the finger tip – is not as reliable or predictable as surgery to replace the hip or knee. Although it usually reduces pain, the range of movement does not improve and, in some instances, the joint can dislocate, stiffen or wear out. Now, surgeons at University Hospital Southampton NHS Foundation Trust (UHS) and researchers from the University of Southampton are using data taken from CT scans and MRI scans, together with motion-tracking technology, to build a precise computerised model of the PIP joint containing billions of pieces of information. The University's computational engineering team in Engineering and the Environment - Dr Chris Phillips, Dr Alex Forrester and Dr Alex Dickinson - have applied sophisticated mathematical methods developed in aerospace engineering to correlate the data from the scans and the motion-capture. Dr Cheryl Metcalf, a specialist in biomechanics within Southampton’s Health Sciences, is also part of the research team. Study lead and consultant hand surgeon Professor David Warwick is joined by consultant radiologist Dr Leonard King from UHS on the project. "Our finger joints can naturally wear out with age and, although symptoms are often manageable, pain can become so troublesome that treatment is considered," said Professor Warwick. "Initially, we can try one or two steroid injections and, if unsuccessful, surgery, which includes either stiffening the joint, known as fusion, or replacement using artificial spacers made of metal or plastic, is considered." As part of the study, funded by the Engineering and Physical Sciences Research Council (EPSRC), the team will also collect the same data of the PIP joint from patients with arthritis both before and after joint replacement. This will allow greater understanding of the effects of disease and how to improve the reliability and predictability of surgery. Prof Warwick added: “Although most people are pleased with pain relief following surgery, their range of movement in the fingers does not improve and, in many cases, worsens – in which case the intervention is disappointing.